Mitochondria evolved from the engulfment of a prokaryote by eukaryotic ancestor cell. During the course of evolution the prokaryotic endosymbiont developed to an organelle that fulfills essential functions like energy production for the cell. During that process the vast majority of the genetic information was transferred to the host nucleus. Consequently, about 99% of the mitochondrial proteins are synthesized on cytosolic ribosomes as precursors and have to be imported into the organelle in a post-translational manner. 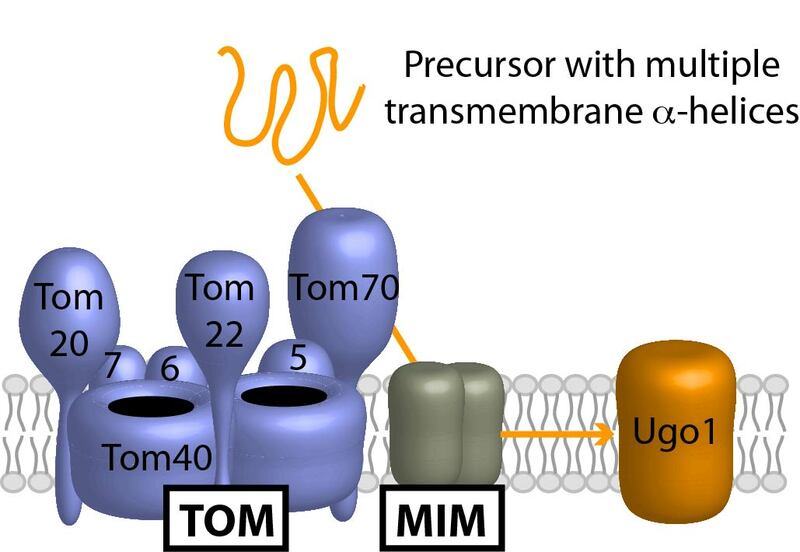 The translocase of the outer mitochondrial membrane (TOM complex) forms the entry gate for most of the precursors. Subsequently, specific protein machineries sort the precursors to the different compartments of mitochondria (Figure 1): Outer and inner membrane, matrix and intermembrane space. Figure 1 gives an overview about the different protein sorting pathways within mitochondria. Modified after Becker et al. 2008, Biochim. Biophys. Acta, 1777, 557-563. We are particular interested in the biogenesis of mitochondrial outer membrane proteins. These proteins span the membrane by one or more transmembrane αhelices or by a β-barrel structure. β-barrel proteins are imported by the TOM machinery and inserted into the membrane from the intermembrane space side by the sorting and assembly machinery (SAM complex). We could show that the action of both translocases is physically linked to each other to ensure efficient import and folding of the precursor (Figure 2). 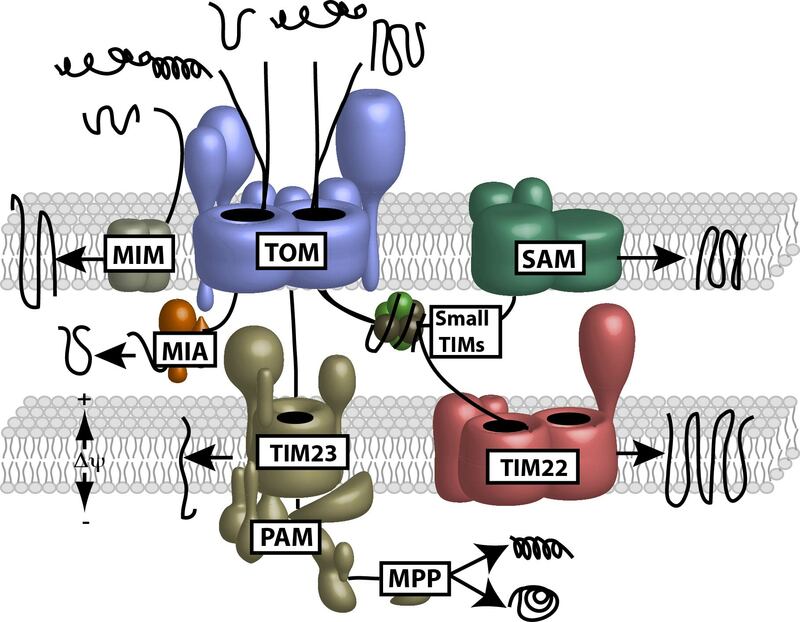 Small Tim proteins of the intermembrane space shield hydrophobic segments and stabilize the binding of the precursor to the TOM-SAM supercomplex. Figure 2 shows the import pathway of β-barrel precursor proteins of the outer membrane. The central receptor subunit Tom22 links TOM and SAM complex. Modified after Becker et al. 2008, Biochim. Biophys. Acta, 1777, 557-563. We have identified a new import pathway for proteins with multiple transmembrane αhelixes. The receptor protein Tom70 recognizes these precursors at the mitochondrial surface. However, the subsequent steps do not require any core-subunits of the TOM complex. Instead the precursors are transferred to the MIM-machinery (mitochondrial import) that is crucial for late biogenesis steps of these precursors (Figure 3). Figure 3 shows the novel import pathway of outer membrane proteins with multiple αhelical trans-membrane spans. Modified after Becker et al. 2008, Biochim. Biophys. Acta, 1777, 557-563. Finally, we studied the assembly of the TOM complex, which involves the association of αhelical embedded proteins with the β-barrel of Tom40. The TOM complex consists of the pore-forming Tom40, the small Tom proteins and the receptors Tom22, Tom20 and Tom70. Strikingly, the assembly of this essential machinery involves the activity of different protein complexes. 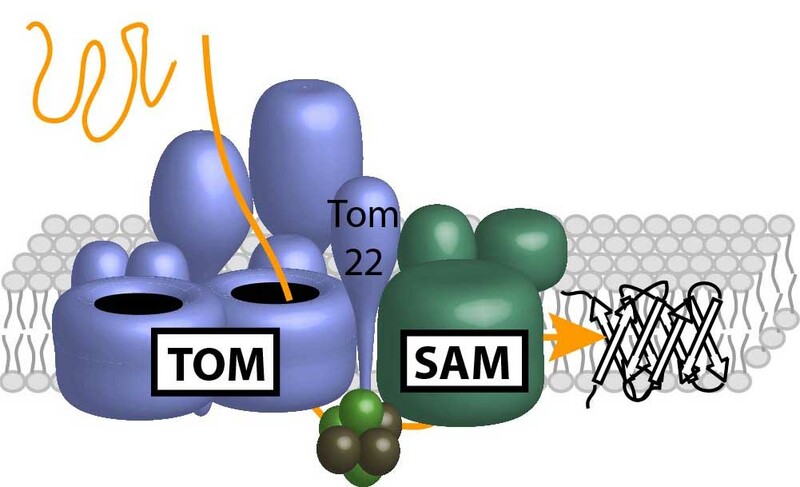 We could show that already at the SAM complex the precursor of Tom40 associates with the small Tom proteins. Tom22 is crucial for the formation of a stable TOM core complex. The association of the Tom22 precursor to the Tom40/small Toms is mediated by a specialized SAM complex, which additionally contains Mdm10 (Figure 4). Finally, the assembly of Tom20 and Tom70 depends on the MIM machinery. These observations show that outer membrane translocases cooperate and modify their function by coupling to different partner proteins. Future studies will address interactions of protein complexes, mechanism of protein biogenesis and the biogenesis of further outer membrane proteins. Figure 4 shows that two different SAM complexes mediate the assembly of the TOM core complex. Modified after Becker et al. 2008, Biochim. Biophys. Acta, 1777, 557-563. Membrane-bound protein machineries carry out crucial functions for the survival of cells. Whereas the protein function has been analyzed in some detail only little is known about the contribution of the lipid environment to protein function. We studied mutants of the bakers yeast Saccharomyces cerevisiae that are impaired in the synthesis single phospholipids. We selected mutants with depleted levels of the two so-called “non-bilayer” lipids cardiolipin (CL) and phosphatidylethanolamin (PE), which do not form a lipid bilayer structure. Both CL and PE are required for full respiratory activity. However, deletion of CL destabilizes the respiratory chain supercomplexes, whereas depletion of PE led to stabilization of even larger oligomeric structures of the respiratory chain. CL and PE are required for proper binding of a precursor to the TOM complex. Strikingly, depletion of PE selectively affects β-barrel biogenesis, whereas the insertion and assembly of αhelical protein remains unaffected. Thus, these phospholipids are important for the function and stability of mitochondrial protein complexes. The goal of this project is to understand the role of the individual phospholipids in mitochondrial membranes and to get insights into the organization of lipid synthesis and transport in the context of a mitochondrial network. Chaperones play a crucial role in the biogenesis of mitochondria. They mediate the transport of precursor proteins from the ribosomes to the mitochondrial surface. Furthermore, the mitochondrial matrix contains a large set of chaperones, which are required for protein folding and protein homeostasis. Prominent chaperones are Hsp70 and Hsp60. The structure and molecular mechanism of the prokaryotic counterparts has been analyzed in detail. However, the functions and interaction partners of these proteins in the mitochondrial matrix remain poorly understood. Figure 5 shows that the mitochondrial Hsp70 and its nucleotide exchange factor Mge1 form a complex together with Cox4, which is crucial for the assembly of the cytochrome c oxidase. Modified after Becker et al. 2008, Biochim. Biophys. Acta, 1777, 557-563. 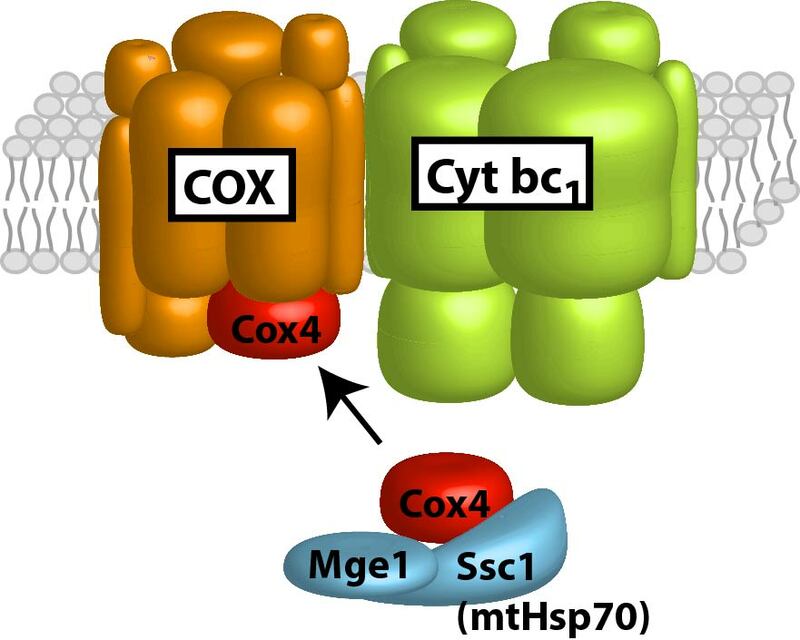 Surprisingly, we have identified Cox4 as an abundant interaction partner of the mitochondrial Hsp70. Cox4 is peripheral subunit of the cytochrome c oxidase of the respiratory chain and is crucial for the formation of the respiratory chain supercomplexes in yeast. A novel yeast mutant of Hsp70 that selectively lost the interaction to Cox4 is impaired in the biogenesis of the respiratory chain supercomplexes. Moreover, Cox4 arrest at the chaperone when the formation of mature cytochrome c oxidase is blocked. Thus, we proposed that the complex Cox4 and Hsp70 serve as a back-up system to allow fast delivery of Cox4 to the assembly line when needed (Figure 5). To identify further novel functions of mitochondrial chaperones we will systematically analyze their interaction partners. Our work is funded by the Collaborative Research Center 746 (SFB 746) and by Cluster of Excellence – Centre for Biological Signalling Studies (BIOSS).